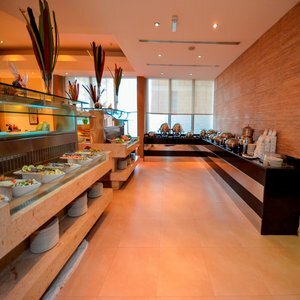 Come and discover Holiday Inn Abu Dhabi Downtown , one of the best downtown hotels for value and service. With 257 well-designed guest rooms and suites, offering personalized service and distinctive Arabian hospitality . Relax with our superb host of amenities , from exceptional restaurants and bars to state-of-the-art fitness facilities and a rooftop swimming pool , an ideal choice for business and leisure travelers. Holiday Inn Abu Dhabi Downtown is idyllically located in the heart of the city , within easy reach to the major commercial and business districts, government offices and embassies , a short drive to the citys main shopping malls with each featuring over 200 stores for your shopping pleasure. Enjoy effortless arrivals and departures with Abu Dhabi International Airport only 35 km away and 15 km away from Abu Dhabi National Exhibition Center. .